By Friday afternoon, most employees were simply exhausted. A week of constant interruptions and emergency meetings for this crisis or that crisis occurred regularly. I liken these moments to ‘interventions’ hoping to salvage what’s left anything good. A coworker handed me a resume of a potential applicant he thought would fit. I seriously didn’t deny the applicant. I merely requested the application and resume be placed on my desk for review. Krista Tippett noted humor lifts us, but underscores what’s already great; our connection with others. And like everything meaningful, it’s complex and nuanced — it can be fortifying or damaging, depending on how we wield it. But as a tool for survival, humor is elemental. Much like the Buddha, laughter is a powerful medium for communicating the unsettling truths in life. For instance, when I was six years old and my brother was seven, we were in the backyard of our Schaumburg, IL home playing war. My brother was in the third branch of a Weeping Willow Tree, with all his G.I. Joe soldiers and weaponry. On the ground was my band of mercenaries, align and prepared for an elongated siege. Without warning, I ran to the garage and emerged momentarily with a lighted M-80 Cherry Bomb and badminton racquet. With the flick of the racquet, the M-80 soared high into the bright blue sky. A second or two later, “KABOOM!” And simultaneous with the sound, a puff of leaves, half the Weeping Willow Tree, including my brother and army tumbled down. Sipping ice tea from a porch chair, my father squinted. In momentary disbelief, he glared. “What happened to the Willow Tree?” he pointed. I don’t believe my father ever learned I launched and detonated an M-80 into his Willow Tree. But as a professional manager, I cannot tell you how many times laughter has connected me with all different kinds of people throughout the country, of all kinds of political persuasions. And I honestly think that out of laughter, comes love. And as a manager, friend, and son I found that no matter how happy people are with the success of getting a great job, we get consumed by the competition, the workload, the hassles, stresses, complaints. Yet, if I can laugh with you and we can see a commonality in humor, I can see you, and I can respect you, and I can love you. 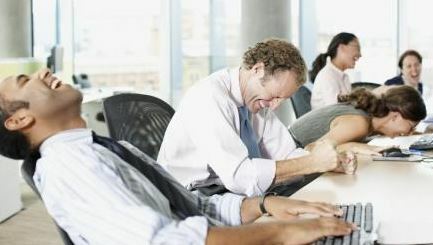 During a recent one-on-one session with an employee, I commented that society needs to laugh more. “How will we accomplish that?” he asked. A wave of confusion circled him.